In response to feedback about the spreadsheet I posted previously, I've changed a few things and have posted a revised sheet here. Changes include getting rid of the dark red (which one person said was hard to read; that category is now green); moving the color key to the top of the spreadsheet so you don't have to scroll to the bottom to see what the colors mean; adding column headers to each page so you don't have to scroll back to the top to see what each column means; re-assigning colors to the categories (so please disregard what each color meant previously); and adding a new category for voters who failed to cast their ballot (there seemed to be an unusual number of these listed -- perhaps indicating a problem with the "cast ballot" button on the machines -- so I thought it was important to create a separate category for these). See my previous post below for further explanation of the spreadsheet. I've been working on this for quite a while and am now happy to finally be posting it online. Several weeks ago I requested incident and tech reports from Sarasota County regarding problems reported during the November 2006 election. I wrote a story for Wired News summarizing the problems revealed in the reports. Now, after several weeks of work, I've created a spreadsheet of all the problems I found in the reports that were related in some way to the voting machines (the majority of the reports were about voter registration issues -- voter names not appearing on the polls due to voters having moved, etc.). I'm asking you to be courteous and please DO NOT REMOVE the file from this site to post to your own web page but instead refer readers to its original source here. Thanks for understanding. You'll find the spreadsheet here. A key explaining the colors on the spreadsheet is on p. 18 of the PDF. Note: In the column marked "Machine Serial No", you'll find that wherever a serial number of a voting machine is indicated, it's followed by a number in parentheses. That number refers to the number of CD-13 undervotes that were on that specific machine. In some cases (usually highlighted in yellow) I've indicated what percentage those undervotes constitute in terms of the total number of votes cast on that machine. I'm a bit bleary-eyed after putting this together so if you notice any errors or inconsistencies, or anything that's not self-explanatory, send me a note and I'll fix or clarify. 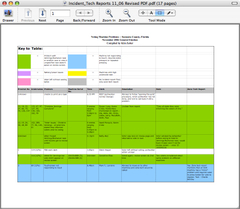 UPDATE: As you can see from the spreadsheet, it's often difficult to surmise from the incident and zone tech reports what exactly occurred with machines. The reports are filled out inconsistently and often cryptically, making it hard to determine what went wrong with machines and how, or if, the problems were resolved. To give you an example of what I'm referring to, I've uploaded scans of some of the incident and zone tech reports (which were made by Susan Pynchon at the Florida Coalition for Fair Elections). Again, please do not remove the files from this site.